Checking the JPL website for the Voyager spacecrafts (https://voyager.jpl.nasa.gov/mission/status/) I can see a distance input from the sun and earth. The description for the distance claims that "this is a real time indicator". Is it really a real time? Or is extrapolated distance based on speed that does not change that much? Or is it because the sun and earth are moving - so we change the distance appropriately? We get information from the Voyagers just about every day for 8-16 hours per day. Getting the information requires that a dish antenna be pointed accurately in Voyager's direction, so that gives two position dimensions with decent accuracy. To get the third dimension (distance) accurately, the spacecraft can be pinged. 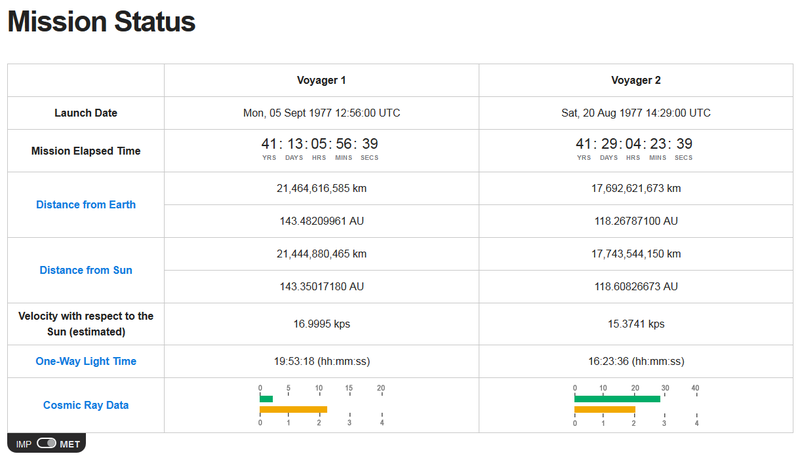 A single ping takes ~2 days and is not something you want to schedule too often: the time Voyager spends waiting for the ping is time it can't transmit science data. But the trajectories of the Voyagers are predictable: there are no planets nearby that can influence their trajectories, so an extrapolation will be pretty accurate for a long time. In practice, the position reported by the website will be an extrapolation. This may be corrected on occasion based on the real data. The 'Cosmic Ray Data' item is data from the spacecraft. It'd be interesting to know how often that gets updated. NASA aims to collect 16 hours of real-time data per day from the Voyagers. Not the answer you're looking for? Browse other questions tagged voyager speed or ask your own question. Does the tape recorder on Voyager-1 still work? For how long will the Voyager records remain playable? How does Voyager take pictures in space?